Is Russia's Arms Industry About to Fall Off a Cliff? The future of Russia’s arms industry appear bleak. Is Russia on the verge of seeing one of its last major export industries fall off? A recent SIPRI report paints a grim picture of the future of Russian arms exports, squeezed by the West on one side and (increasingly) by China on the other. The report suggests that as Chinese arms catch up in terms of technology and reliability, Russia will struggle to hold onto its position as an arms exporter. To be sure, Russia has tenaciously held on to its market share over the last decade, despite some technical stagnation and the growing sophistication of Chinese arms. But keeping its place may simply be untenable in the long run. A major Chinese advantage lies in the huge size and growth potential of China’s defense budget. Growth of the Chinese defense budget has exceeded economic growth over the last two decades, a trend which shows no signs of change. 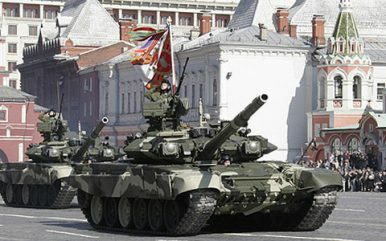 This has created huge domestic demand for arms, even as China has continued (irregularly) to purchase Russian equipment. The Russian economy is considerably smaller, is not growing at a rate commensurate with that of China, and already consumes a larger portion of Russia’s GDP. This means that there is far less room for domestic-demand driven growth in the Russian defense industry, and suggests that capital for innovation and production will continue to be much more plentiful in China than in Russia for quite some time. Structurally, the Chinese defense industry seems to be moving in a more promising direction than the Russian. In particular, China seems to be working harder to incorporate the productivity of its robust civilian economy (particularly in dual-use technologies) into the defense industrial base. The Russian economy has seen no similar success in the developing a strong, private tech sector. China has also demonstrated a considerably greater capacity for capturing and integrating foreign (including Russian) technology, through both legal and illegal means, than the Russian or Soviet arms sectors could ever manage. Russia’s advantages lay in its long history as a major exporter, which have resulted in strong state and bureaucratic support for arms sales, and in strong positive relationships with many buyers. But these are capacities that China is probably capable of building. Moreover, while Russia has long benefited from Western squeamishness about arms transfers to particular kinds of states, China has exhibited no such squeamishness. Russia may see its greatest remaining opportunities in selling directly to its client states, and to states that the Chinese won’t sell to for strategic reasons. But both of those markets are fairly limited; the former includes most of the erstwhile Soviet republics and Syria, while the latter contains only India, Vietnam, and perhaps North Korea. This may be why India and Vietnam have both taken extraordinary strides to indicate an openness to importing U.S. weapons over the past decade, a trend that also places Russia’s share of the international arms market at considerable risk.